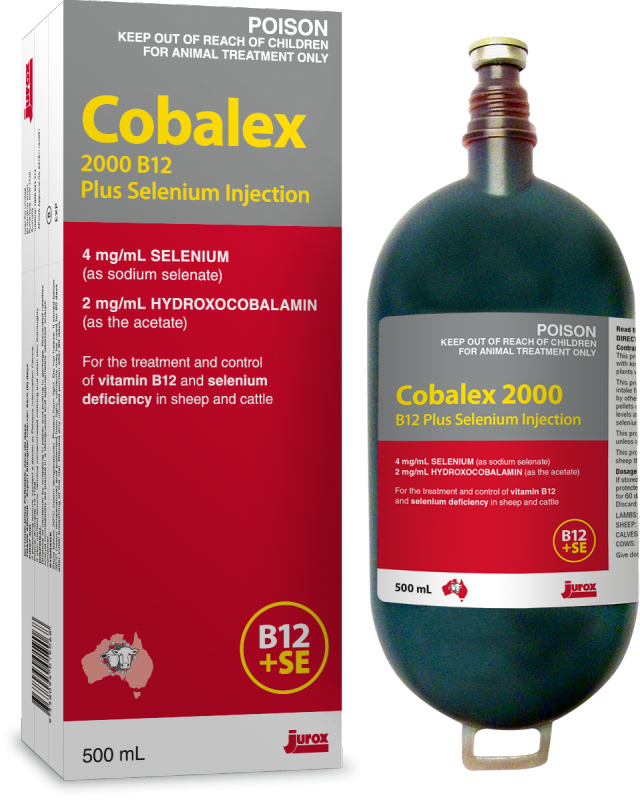 Cobalex 2000 plus Selenium injection provides vitamin B12 and selenium for treatment and control of deficiency. Vitamin B12 is an essential component of a number of enzymes involved in normal metabolism. It is stored in the liver and is necessary for appetite, maintenance of energy, production and growth. Selenium is required by sheep and cattle for growth, and is needed to produce a number of enzymes that are important to normal function. Selenium also appears to have a role in the resistance of animals to disease being involved in the production of antibodies and in eliminating pathogens. For the treatment and control of Vitamin B12 and Selenium deficiency in sheep and cattle. Give by subcutaneous injection only. Frequency of dosing should be related to the severity of the deficiency. Consult your animal health advisor for advice specific to your flock or herd. This product is contraindicated for use in sheep with known liver damage concurrently grazing plants with pyrrolizidine alkaloids. This product is contraindicated for use when selenium intake from pasture is high or selenium is provided by other means (such as top dressing, vaccine, pellets or selenium drenches if blood selenium levels at treatment are high. Users can determine selenium status by consulting a veterinarian. This product is contraindicated for use unless cobalt deficiency is confirmed. This product is contraindicated for use in sheep that are dehydrated or unwell. Free Call (Australia): 1800 023 312 and a Customer Services Representative will assist you.